I do love Wholefoods Market but I’ve got a lot to say about what they should be doing to make their Kensington venture more successful. In fact, 2 years ago I wrote them an analysis and recommendations report outlining just those ideas…and they liked it enough to invite me in to discuss. Thanks guys! I’ll post those notes at a later date but to start with, I wanted to share some new ideas about how to increase sales in the downstairs takeaway section (I got some of this inspiration from a recent trip to the US). On the ground floor there is a takeaway section – with the emphasis on 3 banks of DIY build-a-box salads and other food fayre. 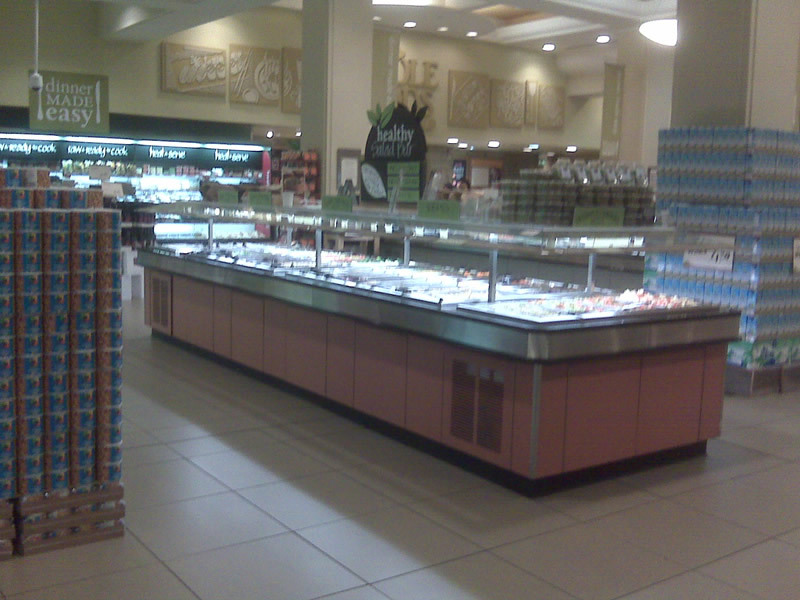 There is a large choice of hot food, cold food and a whole area dedicated to no-oil healthy things. The idea in principal is great but it just doesn’t work. Why not? Let’s look at a successful example. If you visit the WFM in Venice, California you will see packs of bronzed hipsters and families eating from a similar (if not much bigger and more exciting) takeaway section in their store. It’s seen as a convenient, wholesome, healthy and delicious alternative to cooking at home. The food is delicious, the choice expansive and there is an outside dining area where customers eat (they also have the good fortune of fabulous, year-round weather). There is a huge car park for easy accessibility and loading. Friends of mine living in the area ‘dine’ at WFM at least 3 times a week. Eating here is not considered the cheapest option, but is by no means prohibitive either. I guess you’d call it a cool and vibrant hangout. Compare this to the UK version. I rarely see anyone eating from here. I have on several occasions tried the food and have been thoroughly disappointed with the flavours (unlike my US experiences which were always very pleasurable). There are some delicious dishes such as the Chickpea Chana and Spelt with tomatoes but many are bland or too greasy (ironic for a health food store). I tried some of the chicken satay and tofu bars from the deli counter and they came cold, hard and congealed. Before ordering I’d asked if the satay was fatty and was non-passionately told that it wasn’t as it was made from a chicken fillet. However, when I bit into the meat, I encountered lots of fatty bits. Sales in this area are hampered by the customers’ perceived expense of the food mixed with ‘fear of the unknown’ : the food looks like canteen food but the prices seem designer….and as a weight-based pricing system it’s difficult to know how much you are spending. It doesn’t feel comfortable or fun choosing food if you think you are going to be whacked with a large bill at the end (particularly if it then doesn’t taste amazing). And unlike sandwiches or other takeaway items, you can’t return your food if you think you’ve spent too much – once you start making up your box you have to pay for it whatever. The last point that I’d like to make is that the area lacks vibe. As I will go on to mention in future comments about ‘What Wholefoods Kensington Should Do’, vibe and experience is the key to making the store a success. M&S and Waitrose have organic and gourmand to rival WFM but they do it in their own chic, upscale way. People pay those prices because it feels great / special / luxurious to be shopping in those stores. The lower priced supermarkets and discounters such as Asda, Tesco and Lidl offer food at unbeatable prices – it feels great to get goods at special prices. And so Wholefoods must attract customers not just on the strength of its amazing grocery offer but on the special All-American atmosphere, great customer experience and first class customer service. We can’t change the weather or add a huge carpark to the store but there are measures which I believe will make a difference. 1. Offer set price boxes so the customer knows what they are paying for. If this is too drastic, lower the prices! 2. Improve the recipes and aesthetic appeal of food offer. I know WFM don’t like to compare themselves to competitors but the food offer at Planet Organic is far more appealing and healthy looking. 3. 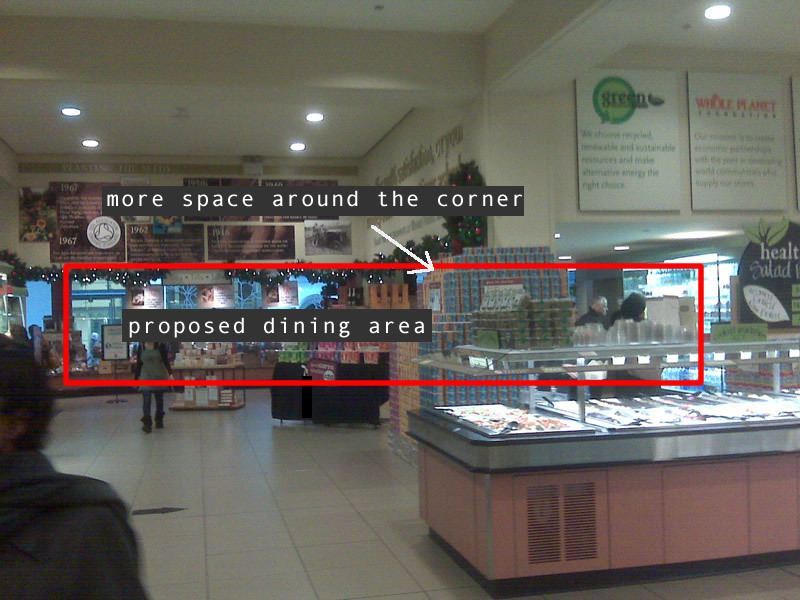 Create a ground floor dining area adjacent to the takeaway banks (currently a hamper section). This would encourage lunch time eaters into the store and attract night time eaters who want a fun and easy dinner meal. This area is wasted on hampers and makes an ideal dining proposition because it’s a cosy space (unlike the rest of store) plus people can see in and diners can see out (hey we have a vibe!). I know there is plenty of room to eat takeaway upstairs but the sheer thought of going up another floor is off-putting (particularly if you’re in a rush). In fact, by adding space downstairs, eating space upstairs can be reduced making way for an expanded (and currently very poor and uncommitted) gifts area (my thoughts for this will be revealed in the next post!). A final point is that consideration should be given to the tables (away with the school-like designs of upstairs) – I think communal tables and a small amount of 2-seaters in rustic or innovative materials would be good. A downstairs dining area would create an unusual fast (vibey, American, west-coast) and slow (quality, personal, special) environment.